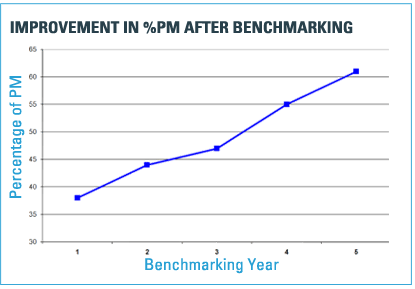 The case study below illustrates these savings for a group that has been benchmarking for 5 years. The group represents 58 companies with 238 buildings. The median facility size for the group is 468,000 square feet. The building type for the group was office space. The key metrics studied were utilities, maintenance and janitorial costs. 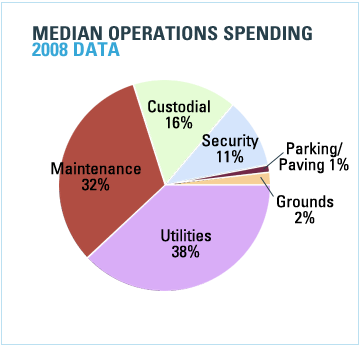 The operating costs for the metrics studied represented 86% of the median operations spending in 2008, as shown in the chart below. Factoring in security increased this spending to 97%. As Figure 1 shows, the group saved $0.17 per square foot (median) after 1 year of benchmarking. After year 2, the median company uncovered additional savings of $0.14 per square foot, for a total of $0.31 per square foot. Over the course of 5 years, the median company reduced its expenses by $2.04 per square foot. Given the median facility area of 468,000 square feet, the savings after 5 years was just under $1 million ($979,200)! Figure 1: Incremental and cumulative savings for the median (50th percentile) company in the benchmarking database Figure 2 shows results for the company in the 70% percentile (only 30% of companies outperformed these numbers). Most people should expect to achieve the savings shown in Figure 2: $1.22 per square foot. The group identified how its cost metrics compared to those of similar buildings in the database. But without examining best practices, this information would have had limited value. Because the participants implemented the practices of the high performers, tracked their results (to develop new metrics), and repeated the whole process, they attained incremental savings each year. One area of focus for the group was the ratio of PM to total maintenance (preventive + corrective). Most facility managers expect planned work to cost less than unplanned work. But what is the optimum percentage of planned work for a maintenance organization and how does modifying that percentage impact cost? As Figure 3 shows, the percentage of PM work was relatively low when first measured: In the first year, the median for the group had a PM of 38%. However, some group members were reporting substantial maintenance costs savings by increasing their PM. Over a 5-year period, the median PM percent for the group rose to above 60%, which correlates strongly with the median savings accrued by the group. 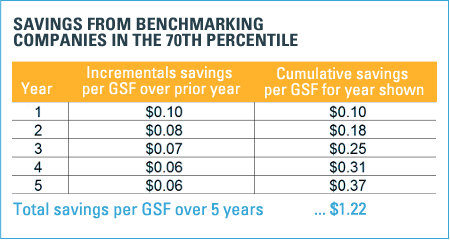 Figure 3: The effect of benchmarking on the ratio of scheduled to total maintenance As Figure 4 shows, the median maintenance costs for those organizations performing between 65–85% PM was about $0.75 per gross square feet (GSF) lower than those performing on 5% PM and $0.50 per GSF lower than those performing just 20% PM. 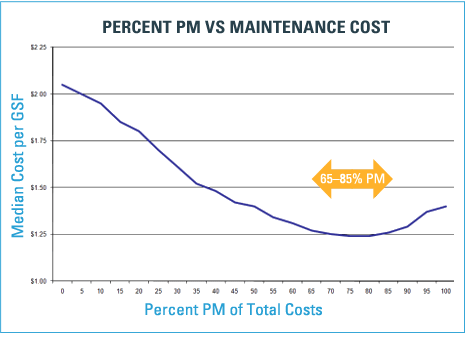 Maintenance costs decreased as the PM percentage increased until they reached the “sweet spot” of 65–85%. Above that percentage, increased PM did not decrease corrective maintenance costs. Knowing that something works elsewhere is often half the battle in implementing change. Benchmarking participants know what to change to reduce costs without impacting the service levels in their organization.